Number 8 Numerology 2017 Horoscope foretells that after an enjoyable year in 2016, it is time to get going again by exerting yourself more. The effects of your preparation last year will be visible in 2017. You may not feel the pressure of working that much. This will be true if you had planned well during the previous year. If not, things will be quite challenging in 2017. You are aware that your personal year number is dependent on the year and hence will be different each year. It increases as the year changes to the next. If your personal number is 7 in 2017, it will become 8 in the year 2018. Personal year number 8 as per numerology readings stands for growth and development. As you are putting in more effort, you will also reap the results to the full. The benefits of hard work may come in many ways. Professionals will advance in their career in 2017. Elderly people will get more social amenities. All aspects of your life will be benefited in one way or the other. Your rewards are not only based on the efforts you have put in this year, but will also be based on your previous exertions. Last year was a year of serenity and you were able to relax physically and mentally. Numerology forecast for number 8 during 2017 is asking you to get back to work wholeheartedly. This personal year number is asking you to work on your self-development. Though it is important to improve your personality every year, year 2017 will provide you with opportunities to grow in gigantic proportions. The numerology 8 2017 forecasts also predict that you will be enhancing your current capabilities this year. But it is essential that you acquire new proficiency to become a better person in the year 2017. Expertise in new fields is much more important than enhancing you present talents. Broadening out your horizons by learning new skills and increasing your knowledge base will help the number 8 people to have a successful 2017. Your vast amount of knowledge will make you an outstanding person in the general crowd. As per the numerology horoscope 2017 for personal year number 8, you will attract the attention of superiors at the workplace, you will stand out in a gathering or simply you will be a fascinating personality. With personal year 8 in 2017, it is imperative that you should be your natural self in 2017 and engage yourself in artistic endeavors. Be enterprising and take risks in life. Have fun by doing things you enjoy. You have to make sure that you excel in whatever has to be done or what you like to do in 2017. This will keep the focus of others on you. If you are your original self, you will be able to attract the attention of others and will become a better individual. The secret of self-development is to be original and to use your natural qualities. 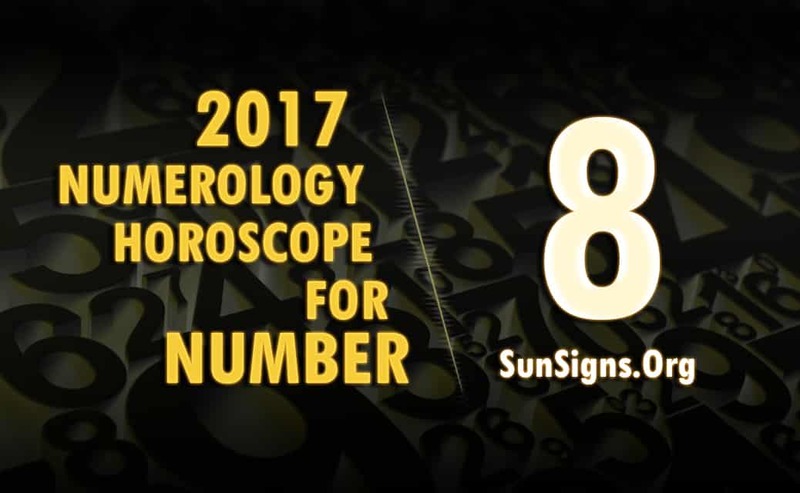 The number 8 2017 numerology horoscope says that you should deem yourself to be fortunate. It is an excellent number symbolism to have and there is a sense of tremendous pleasure. It is up to you to make use of the advantages of the personal year 8 and realize what you really want in life. Number 8 indicates success and growth. If you are already flourishing during the preceding years, this year will be more thriving. Enjoy yourself in 2017!